The friendly staff at Maryland Medical First welcomes your call and looks forward to serving you. 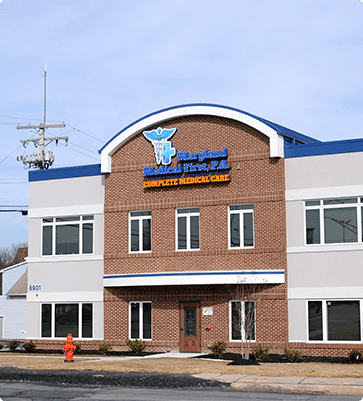 If you have any questions about our primary care services, please call our office at (410) 661-4670. To schedule an appointment, you can call us or use our secure online appointment request form. We are located at the corner of East Joppa Road and Clement Avenue. Phones are answered between 9 am – 5 pm Monday through Friday. In the event of a life-threatening medical emergency, call emergency medical services at 911 immediately. DO NOT WAIT! Inform the emergency room staff that you are a patient of Maryland Medical First and they will contact us. If you have an urgent medical need and need to talk to our doctors after our regular hours, please call our office at (410) 661-4670. A doctor is on-call 24 hours a day. Your call will be returned promptly. At Maryland Medical First, we accept workers’ compensation, Medicare, and most major insurance plans. Please contact your insurance company or you may call our office at (410) 661-4670 to find out if we accept your plan. If you have a question related to your bill or insurance, please contact our billing specialists at (443) 219-3968. If one of our doctors suggests a specialist evaluation or diagnostic testing that requires a referral, we will make every effort to provide this for you as soon as possible. Prescriptions and refills for established patients of Maryland Medical First are routinely issued during our regular office hours (see above). You can make your request by calling our office at (410) 661-4670. No refills are issued during the evenings, weekends, or holidays, as the [doctors do/doctor does – choose according to how many doctors are in the practice] not have access to your medical records during those times. It is helpful to anticipate your refill needs to avoid an interruption in your medication therapy.